A group of fans set up a campaign at "savecarsonbeckett.com" before news of McGillion's departure was confirmed. Although the episode "Sunday" was highly admired, his death caused dismay and outrage among fans and critics. Maureen Ryan of the Chicago Tribune labelled the killing Beckett a "bonehead decision". The producers did not anticipate the protest after the airing of the episode. Between 60 to 100 fans from all over the world gathered for a peaceful protest outside The Bridge Studios in Vancouver on March 22, 2007, hiring a local pipe band. Another protest followed at San Diego Comic-Con International on July 27, 2007. McGillion returned in the cast as a reccuring actor, interpreting a cloned version of Carson Beckett in Season 4 and Season 5 of Stargate Atlantis. 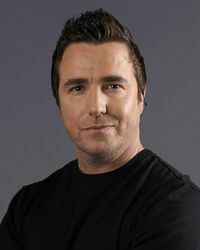 Paul McGillion, Beckett's portrayer, has already portrayed one character in Stargate SG-1: Doctor Ernest Littlefield, Catherine Langford's fiance in 1945, in the Season 1 episode "The Torment of Tantalus". ↑ Sumner, Darren (November 26, 2006). "Atlantis cast member to depart". http://www.gateworld.net/news/2006/11/iatlantisi_cast_member_to_depart.shtml. Retrieved March 12, 2009. ↑ 2.0 2.1 Wilson, Mark (2007). "Carson Beckett: Don't Kill Off the Fan Favorites". About.com. http://scifi.about.com/od/stargate/a/sga_beckett.htm. Retrieved March 14, 2009. ↑ Ryan, Maureen (June 21, 2007). "Time's not on the side of 'Stargate SG-1,' which ends Friday". Chicago Tribune. http://featuresblogs.chicagotribune.com/entertainment_tv/2007/06/times-up-forsta.html. Retrieved March 14, 2009. ↑ 4.0 4.1 Gero, Martin, (2008). The Doctor Is In: The Return of Paul McGillion (DVD – Stargate Atlantis: Season 4). MGM. ↑ Read, David (March 1, 2007). "A Message From Paul McGillion". GateWorld. http://www.gateworld.net/news/2007/03/a_message_from_paul_mcgillion.shtml. Retrieved 2007-03-01. 08. "McKay and Mrs. Miller"
This page was last edited on 28 November 2013, at 12:50.